Garrett Turner, a 2011 Emory University graduate, has been awarded the 2012 Marshall Scholarship for graduate study in England. He is the third consecutive Emory student to receive the scholarship and the 15th overall from the university. Competition for Marshall Scholarships is extremely rigorous, and more than 800 candidates in the United States are interviewed each year for the exclusive awards. The scholarships finance up to 40 young Americans of high ability to study for a degree at the university of their choice in the United Kingdom for two years. Described by faculty members as a scholar-artist and leader, Turner graduated last spring with a double major in creative writing and music from the Emory College of Arts and Sciences. Turner currently is at the University of St. Andrews in Scotland as a Bobby Jones Scholar, having received Emory’s highly competitive Robert T. Jones Jr. Scholarship Award last spring for a year of study at St. Andrews. During his time at Emory, Turner became known among students, faculty and staff as a talented writer, musician and singer who also was generous and humble in his support of others, whether in the classroom or on stage. In Turner’s four years as a student, his voice was heard literally throughout Emory’s campus as a soloist in the university concert choir, as a performer and musical director of the Ahana A Cappella group, in theater productions and in classrooms where he established himself as active scholar. “On behalf of the university, I sincerely congratulate Garrett on his significant accomplishment, and know he will thrive as a Marshall Scholar. As a serious student of the liberal arts in literature and music, he already is an artist of significant accomplishment, and his potential is vast,” says Emory President Jim Wagner. Last spring, Turner’s scholarly work culminated in “I Dream a World: The Life and Work of Langston Hughes,” an original production researched, written and produced by Turner, in which he played the lead role. Using spoken word, poetry, film and music, both instrumental and vocal, and featuring a multiracial cast, the play traces the life and work of the Harlem Renaissance poet. Turner also researched and wrote a second play, “Lost for Words,” which received the Artistine Mann Award for creative writing at Emory. The play subsequently was mounted as a joint production of Spelman and Morehouse colleges. 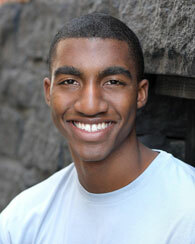 As a Marshall Scholar, he intends to pursue two one-year taught masters of arts: first, an M.A. in theater and performance at Queen Mary, University of London, and second, the M.A. in creative writing with a concentration in scriptwriting at University of East Anglia. Following this work, Turner says he hopes to earn a Ph.D. in creative practice to prepare him for a career in teaching, writing and performance as a professor and scholar. While at Emory, he was a Woodruff Scholar, the recipient of Emory’s most prestigious merit scholarship, which covers all educational costs for four years. Turner is a native of Florence, Ala., and the son of Kevin and Cathy Turner. He graduated high school from Mars Hill Bible School. The British Parliament instituted the Marshall Scholarship program in 1953, named in honor of Gen. George C. Marshall, as a thank you to the American people for the assistance given to Europe in the aftermath of World War II. The selection process in the U.S. is managed by the British Council, on behalf of the British Embassy in Washington, D.C., and the regional Consulates-General in Atlanta, Boston, Chicago, Houston, Los Angeles, New York and San Francisco.